You are here: Home › Further Reading › JFK Assassination FAQs › Did Lee Harvey Oswald Get a Fair Trial? The judicial system in Dallas was notoriously unsympathetic to defendants, although this did not apply to Oswald, who was murdered long before any trial could take place. Lee Harvey Oswald, the only official suspect in the JFK assassination, did not receive any sort of trial. At about 11:25am on Sunday 24 November 1963, just two days after President Kennedy had been shot dead in Dealey Plaza, Oswald was shot dead in the basement of the Dallas police headquarters. Oswald’s murder was broadcast live on television. Unlike the identity of President Kennedy’s assassin or assassins, there is no uncertainty about Oswald’s killer. It was Jack Ruby, a nightclub owner with connections to organised crime. The nearest thing to a trial that Oswald received was his treatment by the Warren Commission and the media. The former put forward a case for the prosecution, and the latter pronounced Oswald guilty. Oswald had assassinated President Kennedy on behalf of the Soviet or Cuban regimes, and the US security system had failed to protect the president from this communist conspiracy. Alternatively, those regimes had been set up, presumably by elements within the US security system, to take the blame for the assassination. Washington insiders were aware of an additional piece of information, which would have prompted even more dissent among the general population had it not been kept secret for many years. It appeared that during the alleged assassin’s visit to the Soviet and Cuban diplomatic compounds in Mexico City a few weeks before the assassination, Oswald had been impersonated. It was not clear whether Oswald had had an accomplice or whether he had been impersonated without his knowledge. Either way, he was involved in a conspiracy. Oswald’s apparent connections to the Soviet and Cuban regimes suggested that the conspiracy in Mexico City was related to the JFK assassination. The public must be satisfied that Oswald was the assassin; that he did not have confederates who are still at large; and that the evidence was such that he would have been convicted at trial. … We need something to head off public speculation or Congressional hearings of the wrong sort. The priority in Washington was the preservation of public trust in political institutions. Finding out who had actually killed President Kennedy was very much a secondary consideration. President Johnson set up the Warren Commission on 29 November, by which time the Commission’s conclusion was already in place: Oswald alone was guilty. This man in Dallas. We, of course, charged him with the murder of the President. The evidence that they have at the present time is not very, very strong. … The case as it stands now isn’t strong enough to be able to get a conviction. Hoover’s comment raises an interesting question of counterfactual history: if Oswald had not been murdered, would the evidence against him really not have been strong enough to get a conviction? Would Oswald Have Received a Fair Trial? It is common knowledge that Oswald did not receive the equivalent of a fair trial from the Warren Commission. In a proper judicial setting, however, things may have been more favourable to the accused. That he had survived long enough to stand trial for the murder of President Kennedy. That he would have been properly represented and his trial properly conducted. That all of the relevant evidence would have been made available for consideration by the jury. Killing a president was not, in 1963, a federal crime. Every murder fell under the jurisdiction of the county in which it occurred. In the case of President Kennedy’s murder, that was Dallas County, which has acquired a particularly poor record for miscarriages of justice. The faulty identifications were the predictable consequences of a criminal justice system that ignored safeguards meant to protect the innocent. The files reveal a law–and–order machine that focused on securing and bolstering eyewitness testimony, regardless of the victim’s doubt or the lack of corroborating evidence. … Thirteen of the 19 wrongly convicted men were black. Eight of the 13 were misidentified by victims of another race. Police investigators and prosecutors in the cases were all white, as were many of the juries …. Police officers used suggestive lineup procedures, sometimes pressured victims to pick their suspect and then cleared the case once an identification was made. … All but five of the wrongful convictions occurred under the late District Attorney Henry Wade. … The Wade era, from 1951 to 1986, was marked by take–no–prisoner trial tactics, conviction rates that topped 90 percent and record–length punishments. In several cases, Oswald’s age, clothing and behaviour made him stand out from the other men; see e.g. Warren Commission Hearings , vol.2, pp.260f. William Scoggins, a witness to the murder of Officer J.D. Tippit, had already seen Oswald’s photograph in a newspaper before attending a line–up: see Warren Commission Hearings , vol.3, pp.334f. Howard Brennan too had already seen Oswald’s photograph, in this case on television, before seeing him face to face in a line–up; see ibid. , pp.142–158. As it turned out, Brennan was unable to identify Oswald as the gunman he had spotted on the sixth floor of the Texas School Book Depository. In two cases, statements identifying Oswald were taken from witnesses before they had attended a line–up; see Warren Commission Hearings , vol.7, p.264 and Warren Commission Hearings , vol.6, p.430. Oswald, like most defendants at that time in Dallas, would probably have had to deal not only with a hostile police force but also with a judge and jury of Texan rednecks. It is far from certain that his case would have been considered objectively. All of the factors that facilitated Oswald’s mistreatment by the Warren Commission and the media would have applied also to his chances of receiving a fair trial, with one exception. It is very likely that Oswald would have received adequate legal representation. Mark Lane volunteered his services to the Warren Commission on Oswald’s behalf, and no doubt he or other competent lawyers would have done so if Oswald’s case had gone to trial. Although the Commission was able to decline Lane’s offer, there is no reason to suppose that a judge would have been able to do so. In the name of national security, the Commission’s hearings were held in secret, thereby continuing the policy which has marked the entire course of the case. This prompts my second question: If, as we are told, Oswald was the lone assassin, where is the issue of national security? What Evidence Might Have Been Available? and the ballistics tests at Edgewood Arsenal, which demonstrated that the Commission Exhibit 399 bullet could not have caused all of Governor Connally’s wounds, and which therefore implied that more than one gunman had caused the non–fatal wounds to Kennedy and Connally. Although the political pressure to blame Oswald would have applied just as much to a trial as to the Warren Commission, the transparency of a public trial would have made it much more difficult to keep exculpatory evidence secret. Would Oswald Have Been Found Guilty? Although it is unlikely that Lee Oswald would have received a fair, objective trial, it is worth considering whether such a trial might have produced a verdict different to that handed down by the print and broadcast media. Did Oswald play an active part in the assassination? If he played an active part, did he do so alone or did he have collaborators? If Oswald did not play an active part in the assassination, what was his rifle doing on the sixth floor of the Texas School Book Depository? The third question can be disposed of straight away. There is no plausible, innocent explanation for the presence at the scene of the crime of a rifle that could be attributed to Lee Oswald. Either he was guilty of direct involvement in the assassination, or he had been framed. The first two questions signify an important difference between the legal and political aspects of the case. From a legal point of view, the question of conspiracy is secondary to the question of Oswald’s involvement in the crime. If Oswald had played an active part in the assassination, he was guilty of a crime, no matter whether he acted alone or with others. Even if Oswald’s role were minor, such as facilitating access to the TSBD, or carrying one of the murder weapons into the building, he would still be guilty of a crime. If Oswald had acted alone, the assassination can have had no political connotations beyond any ideological justifications internal to Oswald. Political institutions could have been criticised only for their failure to protect the president from an unpredictable lone nut. If Oswald had acted with others, or if he had not played any role and had been set up to take the blame, President Kennedy can only plausibly have been assassinated for political reasons. Whichever political group turned out to be responsible for the assassination, a conspiracy would have led to serious popular distrust of political institutions. Rumours of conspiracy were circulating even before Oswald’s convenient execution by Jack Ruby. It was this threat of popular discontent that forced Johnson, Katzenbach and other members of the Washington establishment to set up the Warren Commission. and that he had no political or ideological motive. A prosecutor in a trial, on the other hand, would have attempted first of all to show that Oswald had played a part in the assassination. The prosecutor would not have needed to demonstrate that Oswald had acted alone. Oswald’s own attorney would no doubt have stressed Oswald’s complete innocence, and would have introduced evidence to show that he was the victim of a conspiracy. The doctors who treated President Kennedy claimed that his throat wound was the result of a shot from the front. Oswald, inside the TSBD, was behind the president during the shooting. There is a good deal of evidence from eyewitnesses in Dealey Plaza that shots came from more than one direction. Oswald’s poor marksmanship, combined with the poor condition of the rifle and the very limited amount of time available to him, demonstrated that the only credible candidate for the role of lone gunman is extremely unlikely to have been able to perform all of the shooting. 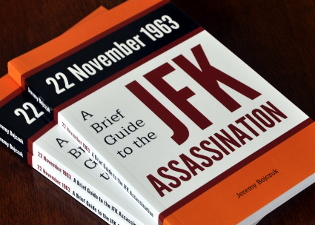 The single–bullet theory cannot be reconciled with the very strong evidence that President Kennedy’s back wound was situated lower than his throat wound, that Kennedy was sitting upright at the time he was shot in the back, and that the sixth floor of the TSBD was sixty feet or 18 metres above the road. Commission Exhibit 399, nicknamed the ‘magic bullet,’ appears to have been inserted into evidence fraudulently. CE 399, incidentally, is one of many items whose chain of possession might have been successfully challenged in court. It is necessary to examine the evidence against Lee Harvey Oswald and apply the level of proof required in a criminal trial. Can Oswald be shown beyond a reasonable doubt to have been actively involved in the assassination? Oswald left three sets of fingerprints or palm prints at the scene of the crime: on two cardboard boxes close to the so–called sniper’s nest, and on the rifle. The palm print on the rifle shows only that the the barrel of the rifle had come into contact with Oswald’s hand at some point. It supports the claim that Oswald possessed the rifle, but does not support the claim that he had handled the rifle during the assassination. Of the prints on the boxes, the FBI’s expert witness stated that one set was probably several days old by the time of the assassination, and the other set has a perfectly innocent explanation: Oswald’s job required him to handle book cartons on the sixth floor of the Texas School Book Depository. If anything, the existence of only two sets of prints on the cardboard boxes by the south–east corner window suggests that those boxes had not been assembled as a ‘sniper’s nest’, and that they were no more suspicious than any of the dozens of piles of boxes elsewhere on the sixth floor. The most fundamental part of the prosecution’s case would have been to establish that Lee Oswald was on the sixth floor of the TSBD during the assassination. One witness, Howard Brennan, described the gunman in a way that could have applied to Oswald. Brennan, of course, came face to face with Oswald later that day at the police station and was unable to identify Oswald as the gunman, despite having seen Oswald’s photograph on television. Other witnesses gave descriptions of the gunman’s hair and clothes that did not match Oswald. Brennan too insisted that the gunman’s clothes were different from those Oswald was wearing at the police station. Carolyn Arnold, a TSBD employee, saw Oswald on either the first or second floor at about the same time as a man in the crowd outside saw a gunman on the sixth floor. The man in the crowd, incidentally, saw the gunman in the south–westernmost sixth–floor window, not the south–easternmost window where the bullet shells were discovered, and stated that the gunman was accompanied by another person, a claim corroborated by another witness in Dealey Plaza. One important piece of evidence that has not survived, but which would have been brought to public notice at a trial, is Oswald’s account of his whereabouts at the time of the assassination. During the two days between his arrest and his murder while in police custody, Oswald was questioned for a total of about eleven hours. The Dallas police, not accustomed to being held accountable for their treatment of suspects, neglected to obtain either a tape recorder or the services of a shorthand secretary for the questioning of the man accused of murdering the president. Consequently, the extant record of Oswald’s interrogation is second–hand and incomplete. The most detailed account of Oswald’s alibi is the later recollection of Captain J.W. Fritz: “I asked him what part of the building he was in at the time the president was shot, and he said that he was having his lunch about that time on the first floor” ( Warren Report , p.600). Evidence from two colleagues, James Jarman and Harold Norman, substantiate Oswald’s claim to have been eating his lunch in the first–floor ‘domino room’ a few minutes before the assassination. It is inconceivable that even the Dallas police would have been satisfied with an account of what Oswald was doing at “about” the time of the assassination. A reasonable person might suspect that a more precise alibi did not survive the Dallas police’s sloppy record–keeping, and that this alibi would have undermined the convenient but poorly supported notion that Oswald had been on the sixth floor. For an informative account of Oswald’s known movements before and after the assassination, see Howard Roffman, Presumed Guilty: How and Why the Warren Commission Framed Lee Harvey Oswald , Fairleigh Dickinson University Press, 1975, pp.209ff (available online at http://www.ratical.org/ratville/JFK/PG/PGchp8.html). Did Oswald Fire a Rifle? Paraffin tests showed evidence of nitrates on Oswald’s hands, but not on his cheek. Such chemicals could have been deposited as a result of firing a gun, but could also have been the result of contact with many everyday objects, including books. An internal Warren Commission memo stated: “At best, the analysis shows that Oswald may have fired a pistol, although this is by no means certain. … There is no basis for concluding that he also fired a rifle” (Memo from Redlich to Dulles, 2 July 1964, Investigation and Evidence File, RG 272, Series 12, box 4, folder 3, National Archives). Neutron Activation Analysis proved that the sixth–floor rifle would certainly have left such deposits on the gunman’s cheek, and that Oswald’s cheek did not contain incriminating quantities of nitrates. It is almost certain that Oswald had not fired a rifle on the day of the assassination. Did Oswald Bring the Rifle into the TSBD? Even though Oswald was not the lone assassin, he may have been the person who brought the rifle into the TSBD, for use by himself or another gunman. His only plausible opportunity to do so occurred on the morning of the assassination. Three witnesses saw him that morning. One witness claimed that Oswald had carried nothing, in contradiction to Oswald’s own statements that he had brought his lunch to work in a paper bag. The other two witnesses were adamant that Oswald had carried a package that was far too small to have contained a rifle. Even the Warren Commission claimed that Oswald had no political or ideological motive, a conclusion supported by the fact that Oswald consistently denied killing Kennedy. Although it is not necessary in a criminal trial to demonstrate the perpetrator’s motive, the lack of a credible motive in this case would surely have been noted by the jury. It is clear that a properly conducted trial, with an impartial jury and competent representation for the defendant, would not have resulted in a conviction. The only item of evidence connecting Lee Harvey Oswald directly with the assassination is the rifle that was discovered on the sixth floor of the TSBD. Even this piece of evidence is far from conclusive. Oswald appears to have purchased the rifle by mail order using a pseudonym, but the patchy nature of the paperwork may have prevented the prosecution establishing this to the satisfaction of a jury. Apart from the rifle, there is nothing other than circumstantial evidence linking Oswald with the assassination. Although he was probably inside the TSBD during the shooting, he almost certainly did not fire any of the shots. The evidence against the defendant was weak and circumstantial. Megrahi, like Oswald, may have been employed by one or more intelligence organisations. The motivation for Megrahi’s prosecution, and his later release, was almost certainly political. Whereas Oswald had been framed before the event, Megrahi appears to have been selected only afterwards. Megrahi had a co–defendant, who was eventually found not guilty. Megrahi had legal representation at his trial, unlike Oswald’s posthumous treatment by the Warren Commission. To maximise the chances of convicting Megrahi, his trial took place without a jury, an option that would not have been available to Oswald’s prosecutors, had the case gone to trial. William Blum, ‘The Bombing of PanAm Flight 103: Case Not Closed’. Paul Foot, Lockerbie: the Flight from Justice , available in PDF and other formats at scribd.com. Gareth Pierce, ‘The Framing of Al–Megrahi’, London Review of Books , vol.31, no.18, 24 September 2009. The title, The Trial of Lee Harvey Oswald , was also used for a two–part TV drama in 1977, with the role of Oswald played by John Pleshette. The show presented evidence and left the viewer to deliver a verdict. by Bruce Gevirtzman, first performed in Hammond, Louisiana, in 1979. On Trial: Lee Harvey Oswald , a London Weekend Television production from 1986, involved an unscripted mock trial lasting 21 hours. Witnesses, lawyers and a jury were flown to London from Dallas and elsewhere. For obvious reasons, only a small proportion of those who would have testified in a genuine trial did so in London. One notable absentee was, of course, the defendant, who was represented by a cardboard cut–out. Nevertheless, the LWT experiment provided a valuable record of the reactions under questioning of many genuine participants in the assassination story. Alas for Oswald, the jury voted to convict him. Vincent Bugliosi, the prosecutor in the mock trial, later expanded on the case for the prosecution in his book, Reclaiming History . For reviews of the edited version of the London Weekend Television mock trial, see the New York Times and DVD Talk. The American Bar Association held a mock trial of Oswald at its convention in San Francisco in 1992. The jury voted 7–5 in favour of Oswald’s guilt. The mock trial gave rise to an interesting analysis of how the jurors’ decisions were influenced by their pre–existing attitudes, and of the effectiveness of the voir dire (literally, “to see to tell”) process, in which jurors may be questioned and challenged by the judge and the attorneys. For details, see Donald E. Vinson and Peter B. Freeman, ‘Oswald Trial Illustrates Hazards of Over–Reliance on Surface Traits of Jurors in Voir Dire’, Inside Litigation , 1992 (available for download as PDF [390 KB] at www.vinsoncompany.com/pdf/). Just as the London mock trial gave rise to one lone–nut book, the San Fransisco mock trial was partly responsible for Gerald Posner’s much–derided Case Closed , which borrowed a third–party analysis of Governor John Connally’s lapel flap to support its claim that Connally had, after all, been hit by the same bullet that had struck Kennedy. A few months before the fiftieth anniversary of the assassination, the Dallas Bar Association organised a mock trial in the Dallas County Court building, in which Oswald himself would probably have been tried, had Jack Ruby not intervened. The jury voted 9–3 for Oswald’s conviction. This blog provides more information about the Dallas mock trial. For the benefit of students, the Sixth–Floor Museum has produced a guide to a mock trial of Lee Oswald. The document is in PDF [308 KB], and can be downloaded from the museum’s website’s lessons plans page. Was the Commission Exhibit 399 Bullet Planted?